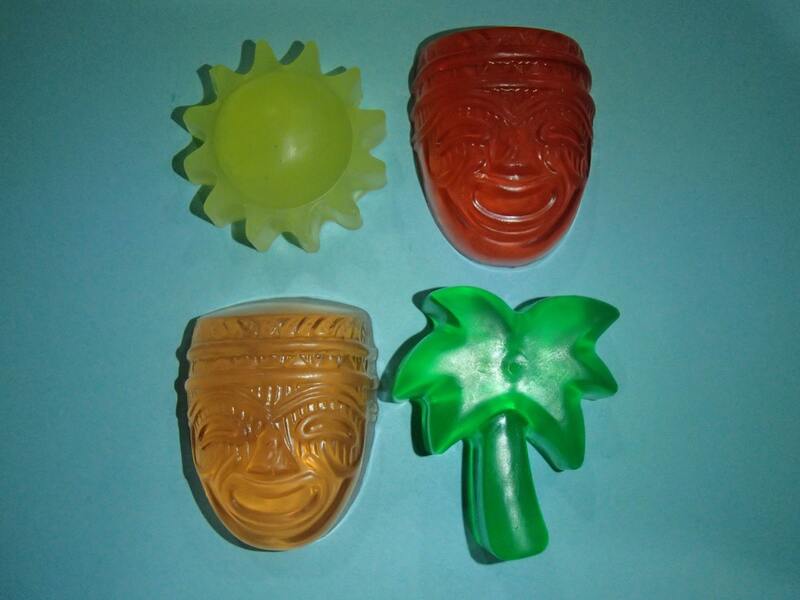 This Hawaiian Luau Soap Set includes soap shaped like a palm tree, a sun, and 2 tikis. This makes a great set for a Hawaiian vacation or a Hawaiian themed staycation. They also make good luau party favors. The Palm Tree Soap weighs ~0.5 ounces. It measures ~1.5 inches in height, ~1.25 inches in width, and ~0.75 inch thick. It is scented Palm Island and colored green. The Sun Soap weighs ~0.5 ounces. It measures ~1.25 inches in diameter and ~0.5 inch thick. It is scented Coconut and colored yellow. The 2 Tiki Soaps each weigh ~0.5 ounces. Each measures ~1.5 inches in height, ~1.25 inches in width, and ~0.5 inch thick. One is scented Mandarin Lime and colored Orange and one is scented Hawaiian Breeze and colored Red.